Vulcan GMS was purchased by our current chairman Chuck Yanke in 1978. At that time, there were just two employees and the company consumed only a couple loads of material per year. Vulcan was a different place but the company quickly took off. Today Vulcan GMS does more in sales per day than the company did annually in the first year. In addition, Vulcan now brings several material loads per week – also more than the entire first year. Many things have changed but some remain the same, such as our focus on our customers’ needs, responsiveness to those needs and finding innovative ways to solve customer problems. Vulcan GMS is the market leader in what we do – offering our simple solutions to complex problems. We pride ourselves on being a partner to our customers, offering multiple solutions through design review. As Vulcan continues to grow, the scope of the products we can provide our customers has greatly expanded and we look forward to continued growth in the years to follow. 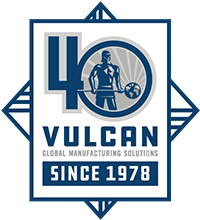 Join us in celebrating our 40th anniversary and put Vulcan GMS to the test to solve your complex manufacturing problems. We appreciate all of our dedicated customers that helped us get to this point and we are committed to supporting them for years to come.